The society of the arch-Heathens was a hierarchical society. A society in which every person’s worth was meticulously evaluated. From thralls, to Freemen, to the ruling Elite; groups of people were not equal to other groups of people, and people were certainly not an equals of a god. There is written evidence of men kneeling to Chieftains, Lords and Kings. In fact this is still carried on today in some places. We also have written accounts of men kneeling, not just before the gods themselves, but also to divine idols. Men were not equal to the gods and the arch-Heathens recognized and accepted this. This is apparent due to written accounts of men being subject to full outlawry for refusing to kneel in sacred spaces. Knowing that outlawry was the most serious of punishments, it is clear that kneeling was important. Most of us were raised to show our elders respect. Few address their grandparents by their first names but rather as grandma, grandpa, sir or ma’am. We do so out of respect for the lives they’ve lived and the active role they have taken in making us the people we are. This is even more relevant when considering the Gods. While they may not take an active role in your life, they are far superior to the common man. Not only superior in the way they live their lives, but certainly superior given their superhuman abilities. This isnt to say that we should kneel to our grandparents. It is saying that certain positions demand very specific levels of respect. The level of respect for going to a God is to kneel. If we say the gods ought not be knelt to or that we are equal to them, then why do we engage them in a gifting cycle, why to we look to them for favor and luck? Despite the evidence that we have to support the practice of kneeling, there still seems to be reluctance to do this in modern times. It can be agreed that most of us no longer live in strictly hierarchical society, and some things must evolve and change in the modern era. However, to try to lower the gods to the level of men or raise men to the level of gods is folly. We are less than the gods and will remain that way. We dare not assume to know what is in the minds of the gods, but it seems logical that if they expected followers to kneel in the past, they would expect the same level of respect today. Things will grow and change, and no one call tell you what is best for your inner-yard. However, changing things just to change them is silly, and changing things simply to be different than other religions is even worse. -[wpfilebase tag=fileurl id=9 linktext=’Ibn Fadlan’ /] describes the Swedish Rus prostrating before a carved image of a God. -In Flateyjarbok, Hakon Jarl goes to a clearing and kneels towards the north and proceeds to say prayers to his fulltrua, Þorgerðr Hölgabruðr. 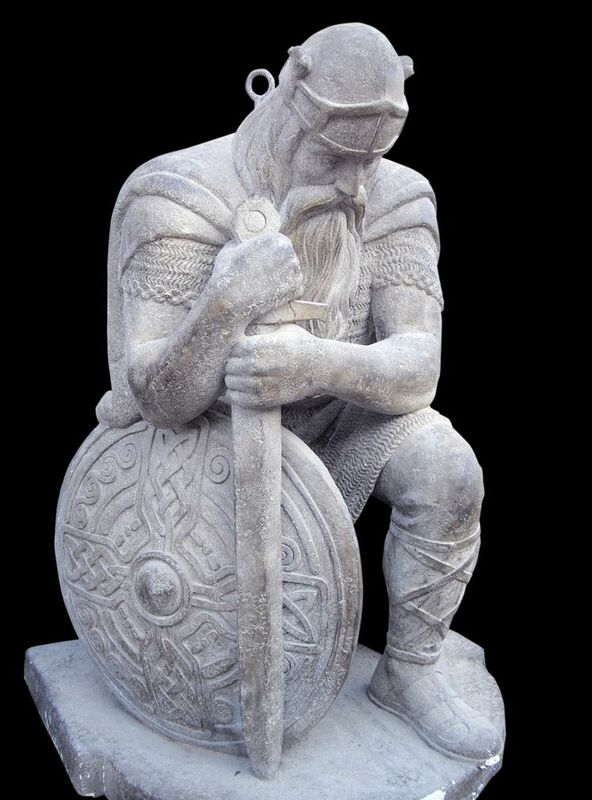 -Harðar saga og Holmverja tells of a man called Þorsteinn who habitually goes to the temple and goes “down before the stone in the temple where he sacrifices”, ie he kneels or prostrates himself in front of the altar. -Kjalnesinga Saga tells about how the son of a temple goði, Þorsteinn, prosecutes a man named Búi for átrúnaður(false religion) due to Búi’s refusal to prostrate himself on the ground before God statues, like other worshipers did. Búi is sentenced to full outlawry, but he sneaks back later, waits until Þorsteinn is laying face down in worship in front of the statue of Thor in the temple, and murders him. -The entry for Sol in the Norwegian Rune Poem is very interesting: Sól er landa ljóme; lúti ek helgum dóme. This often gets rendered as “The sun is the light of the world; I bow to the holy decree”, but there are many meanings of dómr that have caused some to translate the line differently. Dómr can mean a judgement or decree, a state or condition, or, when preceeded by heilagr, holy relics (per Zoëga’s Concise Dictionary of Old Icelandic). Aslak Liestøl thus translates the second line as “I kneel before the holy shrine”. **Sources located at http://grumpylokeanelder.tumblr.com/post/81946750776/heathen-statues-and-idols-worship-building. We missed the attribution on this article for the original research that was used for the above references, for which we apologize. I was unaware this was your source list, it’s one I copy pasted from a friend awhile ago. I fully believe in giving credit where it’s due. As the credit for the source list is yours I thank you for compiling it. I can delete it if you like. Are there any English translations available for the saga sources referenced here? I can only find them in Icelandic and Danish.